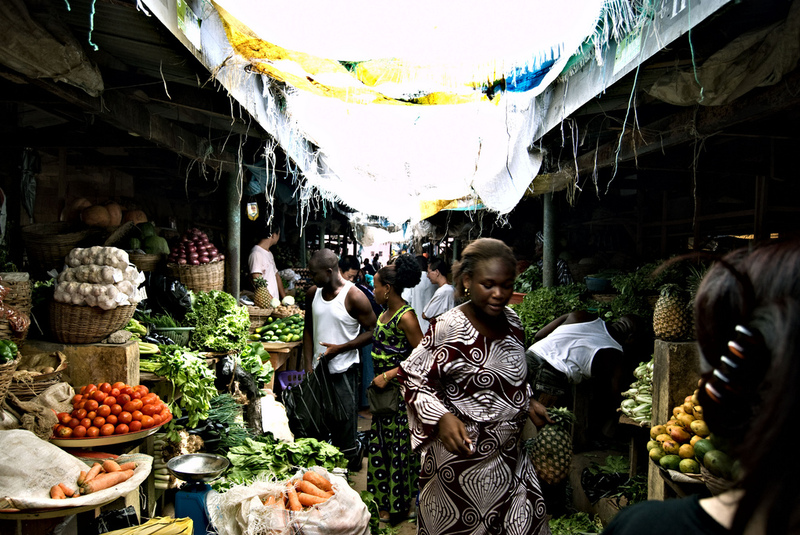 Lekki Market in Lagos. Photo by Shawn Leishman. Alexander-Julian Gibbson is a Nigerian-American fashion photographer who knows his way around Lagos, particularly when it comes to shopping. Concept stores are the best way to discover some of the most interesting talents in the city all in one place. You’re sure to find a stunning piece from your favorite designer or one you may have never heard of in any one of Lagos’ many well-curated concept stores. You will often find a mix of local designers that use traditional techniques and fabrics combined with modern silhouettes to create pieces unlike anything you’ve ever seen, plus staple accessories from your favorite high-end brands like Rolex, Louboutin, and Givenchy. Local designers use traditional techniques and fabrics combined with modern silhouettes. Grey Velvet is one of Nigeria’s most popular luxury concept stores, specializing in contemporary womenswear, menswear, shoes and accessories. They have a wide price range of items starting as low as N15,000 (approx $40). Temple Muse is great because on top of carrying some of the best womenswear in Nigeria, they also carry unique gifts, trinkets, and contemporary African art. They even host a quarterly art exhibition inside the store where you can purchase any of the pieces on display. Alara, Lagos’s trendiest retail spot, is a concept store that features inspirational art pieces as the backdrop to their hefty collection of womenswear. The store design is an architectural feat, designed by Nigeria’s Adjaye Associates. It even has a restaurant-slash-terrace lounge and art gallery connected to the store that serves as a host for all the most exclusive events during Lagos Fashion Week. The Lekki Arts and Craft Market is a must-visit for all shopping experts. Travel influencers flock to this spot for the perfect Lagos market ‘gram, mainly for its picturesque arrangement of colorful woven baskets, bags, and accessories. But rest assured, it’s more than just photogenic. While the sheer quantity and variety of products tends to overwhelm (plus the fact that it is quite literally set up like a maze), you’ll find the most amazing handmade leather shoes and bags, plus souvenirs, trinkets, jewelry, and artwork that you wouldn’t be able to find anywhere else. Nigerian markets are nothing short of a battleground. Beware: This is no easy endeavor, and not for the faint of heart. I recommend taking a seasoned veteran and/or local with you to help navigate. Nigerian markets like this one are nothing short of a battleground, but the spoils are all worthwhile. Lagotians have managed to skip over the regular online shopping craze and have instead gone full-force into the age of Instagram shopping. Many designers and tailors in Lagos have opted for Instagram-only web stores, in which you’re able to see the collection and place an order without ever having to leave the app—just follow these three steps: choose a design, place an order in-app or through WhatsApp, and pay upon delivery. A lot of this works best with custom orders, so be sure to have your measurements on hand. Features dresses, tops, and bottoms all under N5,000 (approx $15). Offers effortlessly chic statement pieces. Featuring bold ready-to-wear, from blazers to jumpsuits. Shop here for contemporary casual with prints that pop.